Man is a spiritual traveler, irrespective of your belief, be you an atheist, a Christian, Hindus, Muslim, Buddhist or whatever. In real life there are three scenarios that worth pondering about. These are occupy till I come scenario, the last judgment scenario, and, the hope and resurrection of the dead scenario. 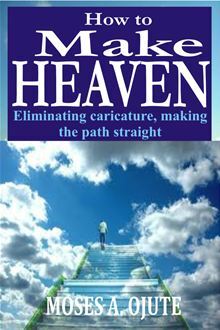 How to make heaven: Eliminating caricature, making the path straight is an undiluted guide to finding your way into secured eternity after death. It explains in detail the truth about the kingdom of God, the parameters for God’s judgment, and what actually qualifies a person to make heaven. The book revealed that most terminologies have been blown out of proportion, misrepresented and therefore delve into those controversial issues such as faith and works, appropriation of faith and works, biblical justice, mercy and compassion, faithfulness, one – tenth, tangible and intangible giving, sorting them in such a way that you will no longer be confused about what it would take you to have a triumphant life on earth and eternity.